LOA: 26'7" Beam: 9'5" Draft: 3'2" Dry Weight: 11,741 lbs. Bridge Clearance: 9'7"
Fuel: 82 gals. Water: 20 gals. Holding: 20 gals. The forward deck features stainless steel rails, anchor roller, hawse pipe, anchor line locker, deck hatch, and plenty of room for lounging in the sun. The forward deck is accessed through a walk-through windshield and integral steps up to the opening. Very easy access.<P>The helm station is comfortable and gorgeous with dual analog instruments set in a burnished wood dash. All controls are at your fingertips here. Very well organized. The steering wheel is comfortably wrapped and ergonomic. The breaker panel is at your feet for easy access. The windshield features two wipers to keep your vision unobstructed. 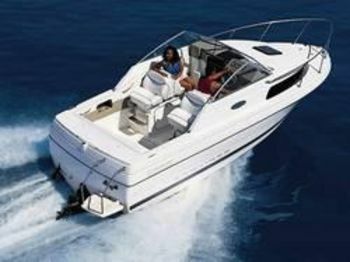 Two people can sit at the helm on the starboard side and another comfortable seat is located just aft on the port side. Put up the bimini top on a hot day to keep the sun off. Aft of the helm, an entertainment area with wraparound seating and removable table makes for comfortable socializing. This unique space is quite popular for entertaining. The entertainment area seating converts to another berth with the eisenglass enclosure. Or, you can use the area as a sun pad for an afternoon nap. A spacious swim platform with Weaver brackets is accessed through a transom door. A ladder and transom grab rail make it easy to get in and out of the water. The swim platform is another nice touch for entertaining as guests can easily move from the entertainment center to the water and back. The entire cockpit has Berber carpeting. A very nice touch and wonderful feeling on the feet. The cockpit also features lighting throughout. This deck was made for enjoying and entertaining. Lots of space, seating, and nice features.